In majority of recusals, SC judges have not given reasons but in instances where they have, they range from conflict of interest to personal issues. 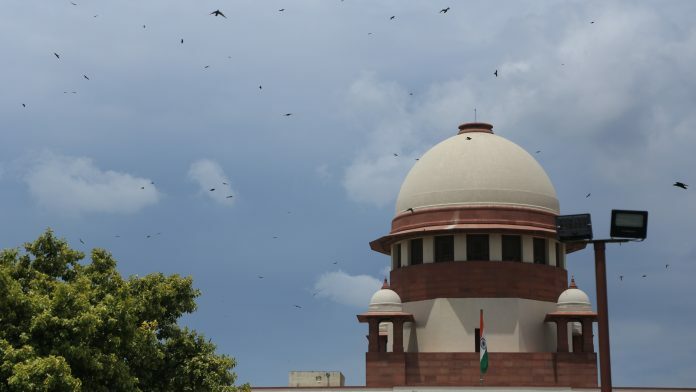 New Delhi: Justice N.V. Ramana Thursday recused himself from hearing a plea that has challenged the Centre’s appointment of M. Nageshwar Rao as the interim director of the Central Bureau of Investigation (CBI). He is the third Supreme Court judge to do so after Chief Justice Ranjan Gogoi and Justice A.K. Sikri. Justice Ramana cited his personal friendship with Rao as the reason for his recusal. As for the other two judges, Justice Sikri was part of the high-powered committee that relieved former CBI director Alok Verma of his duties while CJI Gogoi is part of the panel that will appoint Verma’s successor. According to this report, data from the Supreme Court website has revealed that in 2017, 28 judges had recused themselves from at least 376 cases. ThePrint looks at a few of the cases where judges have recused themselves. One of the most high-profile recusals came in the Ayodhya temple title suit. On 10 January, the Supreme Court deferred its hearing on the Babri Masjid-Ram Janmabhoomi title dispute case after it was pointed out that Justice U.U. Lalit, one of the judges on the five-judge bench, had appeared in a contempt case pertaining to this matter in 1994. Justice Lalit, who subsequently recused himself, was one of the lawyers who represented former Uttar Pradesh chief minister Kalyan Singh in a 1994 contempt matter related to the case. The matter will now be heard with a new Constitution Bench that includes the CJI along with Justices S.A. Bobde, D.Y. Chandrachud, Ashok Bhushan and S. Abdul Nazeer. One of the curious examples of recusals is in a 2015 plea, filed by advocate Sanjay Jain, which challenged the provisions of the Motor Vehicles Act. Several judges have heard the matter over the years and in 2017, six judges recused themselves without providing any reasons. They include Justices J.S. Khehar, Sanjay Kishan Kaul, Dipak Misra, S. Abdul Nazeer, Madan Lokur and A.K. Sikri. The case has been through several benches. When it first came up in the apex court on 20 November 2015, Justice Ranjan Gogoi and Justice N.V. Ramana heard the matter. Since then, the matter has come up before Justices T.S. Thakur, Sikri, R. Banumathi, Khehar, Chandrachud, Kaul, Misra, M.M. Shantanagouder, J. Chelameswar, Nazeer, Lokur, Deepak Gupta, and Bobde. At some point in the past four years, registrars Pawan Dev Kotwal and K. Arul have also heard the matter. The matter was last listed on 28 November 2018, when Justices Bobde and L. Nageswar Rao heard the matter. On 4 May 2017, Justice Chelameswar recused himself after hearing a plea pertaining to the February 2016 violence in Patiala House district court. Justice Chelameswar heard the matter for over a year before recusing himself. He offered no reason. Justice Chelameswar also recused himself from a plea pertaining to the allocation of judges in Andhra Pradesh and Telangana after hearing the matter more than 20 times. One of the most high-profile examples in this category came in the Sahara-Birla case when Justice Khehar recused himself after almost eight months of hearing the matter. The Sahara-Birla matter was a plea seeking an independent probe against various lawmakers for having allegedly received illegal gratification from the Aditya Birla and Sahara groups. On 16 December 2016, Justice Khehar recused himself after advocate Prashant Bhushan, representing NGO Common Cause, which had filed the plea, pointed out that in light of the judge’s appointment as the next CJI he should recuse himself. At the time, Justice Khehar was the senior-most judge set to succeed the incumbent CJI within a month. The verdict in the plea was ultimately delivered by Justices Arun Mishra and M.M. Shantanagouder in July 2018. In another unusual example, Justice Lokur recused himself after delivering the verdict in a case. Justice Lokur was part of the bench that had lifted the ban on the sale of firecrackers in the National Capital Region (NCR) in 2017. He had, however, recused himself by the time a plea seeking a recall of the order came up in the Supreme Court. Around 10 days after the verdict, one of the counsels in the matter had pointed out that Justice Lokur, before he had been elevated as a SC judge, had once served as an amicus curiae in the Delhi High Court, in a 1998 case over crackers, when he had defended the ban on the sale of fireworks.